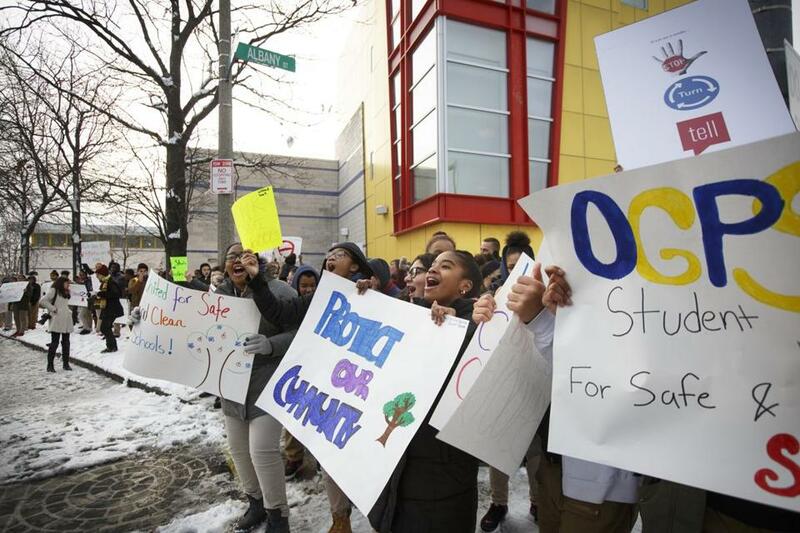 Students from Orchard Gardens protested in front of their school on Monday morning. On his way to school in Roxbury each morning, Emanuel Pires tries to avoid the discarded needles that heroin addicts used. But they are everywhere — on the sidewalk outside the school, on the ball field, on the street. This has been Pires’s reality for four years. On Monday, Pires and 49 other students joined teachers and administrators outside Orchard Gardens K-8 Pilot School to declare they’ve had enough. They directed their frustration mostly at the city and the school district, saying that officials have neglected to keep their school safe and free from the needles. Holding signs that said “No More Needles” and “Safe Schools,” the schoolchildren said they should not have to be exposed to the problems associated with opiate addiction in the neighborhood. “Hey Ho! All the needles have to go,’’ they shouted. Passing drivers honked. The children squealed in delight. They were doing something — hoping that this time it would make a difference. “We’ve seen a lot of needles and needle caps on the ground,’’ said Pires, an eighth-grader whose class organized the rally as part of a civics project. Orchard Gardens, a bright yellow school on Albany Street at Melnea Cass Boulevard, sits in the midst of an opiate addiction crisis. Surrounded by a slew of homeless shelters, the school is blocks away from an addiction treatment facility at Boston Medical Center. Students and school officials say discarded needles are commonly found on the grassy patches near the faculty parking lot, the trees behind the school, and the soccer field adjacent to the school’s playground. “I’ve picked up eight needles from the playground’’ recently, said the school’s nurse, Sue Burchill. Each morning and afternoon, Burchill and a janitor make the rounds, filling an orange bucket with discarded needles. They also encounter condoms and human excrement, Burchill said. Food has gone missing from the school’s garden. And students have had to navigate through homeless people who pitch tents along the sidewalk. “We’ve had it,’’ Burchill said. The school has been trying to tackle the needle problem for at least four years, to no avail, said principal Megan Webb. School administrators have been pressing the city and the school district to clean up the needles. They have been appealing to them to put bins where the needles could be properly discarded, held meetings with police, and organized a massive cleanup of the parking lot. There have been many promises, Webb said. But the needles persist. “We’re sitting in . . . the epicenter of the Methadone Mile, so for years we’ve been working with the city and the district to clear up the area. We have not succeeded. And of course the students see it. It’s everywhere,” Webb said. City and school officials said they are striving to ensure there’s a safe environment for Orchard Gardens students as they work with the Public Health Commission and the Police Department. “From regularly conducted syringe pickup sweeps, to an active police presence in and around the school property, to training sessions with school staff on safe handling procedures, BPHC, BPD, and BPS will continue to collaborate on the securing of resources and executing a multifaceted response to ensure student safety at Orchard Gardens,” said Nicole Caravella, a spokeswoman for the city. A team from the Health Commission sweeps school property regularly, and custodians at the school search for discarded needles each morning, a School Department statement said. A full-time school police officer is on site, and city police officers patrol the area. In addition, the statement said, custodians and nurses are equipped with needle-safe gloves and special containers to safely get rid of syringes. Meanwhile, the school has been handing out brochures to students, warning them in three languages that if they see a needle to stop, turn, and walk away — and to tell an adult, be it a teacher, parent, or police officer. Yet students and administrators at the school said the city isn’t adequately addressing the issue. It’s not lost on them, they said, that Orchard Gardens is in a poor community. The school’s 1,000 students hail from low-income families, many with parents who work two jobs to make ends meet. “The city is not doing enough, because we still see needles on the ground,’’ said 13-year-old Janiah Wimes of Roxbury. She said she and her mother often spot used needles on their way to school and while walking their dog, who got poked by a needle. “She’s OK now,” Wimes said. When the school year started, the needles issue became a focus in Colin Turner’s eighth-grade class. The students had started a leadership project as part of a statewide effort called Generation Citizen, which promotes civic action in the classroom. Turner’s 23 students began studying the issue in October. They met with an addiction treatment specialist at Boston Medical Center, and with the school nurse, principal, and dean of students to learn more about the needles and addiction, Turner said. They also learned that addicts are afflicted with a disease and that it is the city’s job to keep students safe. Jayson Barros, another 13-year-old in Turner’s class, said seeing needles in Dudley Square “makes me feel disappointed that the city isn’t taking care’’ of the students. He said he feels proud that the students came out to call attention to the issue. Students at the hourlong rally included sixth- and seventh-graders. They met inside the school with district officials, but reporters were not allowed at the meeting. The students had a list of recommendations, including adding at least five needle-safe barrels around the school property, daily sweeps of the school grounds, a cleanup crew to clear leaves from the property, and a safety task force that would include students.